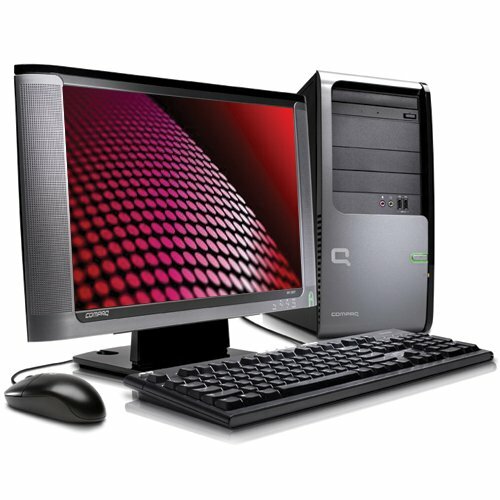 Whether you're e-mailing family and friends, balancing your online checkbook, or listening to your digital music collection, the newly restyled HP Compaq Presario SR5710F desktop PC offers a versatile, strong base for your home computing needs as well as easy-to-use multimedia features. Focusing on affordability, this desktop provides room to grow with the ability to add up to 4 GB of RAM, available PCI and expansion slots, and access to a wide variety of peripherals via its six USB 2.0. It's also chock-full of security and productivity software to get you going as soon as the PC's unpacked from its box, including Symantec Norton Internet Security 2009 and Microsoft Works 9. You can also easily burn your home video productions to DVD for friends and family with the 16x dual-layer, multi-format LightScribe DVD/CD burner, which enables you to store up to 8.5 GB of data on a DL disc. Other features include a 2.3 GHz AMD Athlon X2 4450e+ dual-core processor, 250 GB hard drive, 3 GB of installed RAM (4 GB maximum), Nvidia GeForce 6150 SE video card with up to 1343 MB of allocated video memory, and 6-channels of surround sound audio. It comes preinstalled with Microsoft Windows Vista Home Premium (Service Pack 1), which includes all of the Windows Media Center capabilities for turning your PC into an all-in-one home entertainment center. In addition to easily playing your DVD movies and managing your digital audio library, you'll be able to record and watch your favorite TV shows (even HDTV). Vista also integrates new search tools throughout the operating system, includes new parental control features, and offers new tools that can warn you of impending hardware failures. Processor: AMD's Athlon X2 4450e+ dual-core processor is built for tomorrow's 64-bit applications, which will require a processor with significant power. Dual-core technology is like having two processors working together, each one taking care of different applications, so power-users actually experience greater performance when multiple applications are running. Digital media enthusiasts will appreciate the enhancements while simultaneously working in high-definition video and photo editing and audio mixing programs. It includes such AMD features as HyperTransport Technology (which increases the communication between integrated circuits) and Enhanced Virus Protection. Hard Drive: The generous 250 GB Serial ATA (SATA) hard drive (7200 RPM) offers a wealth of storage space, perfect for storing a vast multimedia collection or for editing digital video. This SATA hard drive has a 3Gb/s interface speed that enables up to 300MB/s data transfer rates (double the speed of the current SATA interface of 1.5Gb/s). Memory: The 3 GB of installed RAM (1 x 1 G, 1 x 2 GB; PC2-6400) will more than satisfy your multimedia needs, but you still have room to add more RAM to handle today's demanding computational needs. This desktop has a 4 GB maximum RAM capacity (2 x 2 GB). It also offers a lightning quick 800 MHz RAM speed. DVD/CD Drive: This multiformat DVD/CD drive is compatible with writing both DVD+ and DVD- disc formats as well as dual-layer (DL) DVD+/-R discs, which can store up to 8.5 GB of data. It features 12x DVD¡ÀR DL Write Once, 16x DVD¡ÀR, 8x DVD+RW, 6x DVD-RW, 12x DVD-RAM, 40x CD-R, 32x CD-RW write speeds and 40x CD-ROM, and 16x DVD-ROM read speeds. This LightScribe DVD¡ÀRW drive lets you laser-etch silkscreen quality text and images on to CDs and DVDs . Your software, PC and discs work together for a no-hassle way to burn just the labels you want. After you burn content, just flip the disc over, reinsert and burn your label--anything from a simple title to a full-disc work of art. Keyboard & Mouse: It comes with a Compaq keyboard and scroller mouse (both with PS/2 connections). This desktop features an integrated Nvidia GeForce 6150 SE graphics/video card with 128 MB of dedicated graphics memory. Windows Vista can also allocate up to 1343 MB of total graphics memory from the system memory. It features NVidia's PureVideo technology--which provides great picture clarity, smooth video, accurate color, and precise image scaling for video content--and full support for Microsoft DirectX 9.0 for stunningly realistic cinematic effects for all DirectX-compatible applications. It also offers an integrated audio card that can produce high definition surround sound configurable to 8 speakers. Microsoft Windows Vista Home Premium with SP1 (32-bit) is the operating system for users with advanced computer needs, and it includes all of the Windows Media Center capabilities for turning your PC into an all-in-one home entertainment center for watching DVD movies and accessing your digital audio library. You can also use Windows Media Center to record and watch your favorite TV shows (even HDTV) and to access new kinds of online entertainment content. Computers that include Windows Vista Home Premium and an auxiliary Windows SideShow display will also allow you to access key data even when your computer is off. It is also easier than ever to share files between other PCs in your household and to manage your laptop computer settings to more securely connect via Wi-Fi. muvee autoProducer Basic: Automatically create professional looking home videos and burn to DVD. Cyberlink DVD Suite Deluxe: Automatically fix and edit videos and create CDs and DVDs. Edit, burn and archive data to discs. Microsoft Works 9: Includes a word processor, spreadsheet, database and calendar. Microsoft Office Home and Student Edition 2007 (60-day trial version). Adobe Reader 8: Read and print PDF files. Norton Internet Security 2009 protects your PC and your identity when you email, bank and shop online; 60 days of protection updates included. This desktop measures 16.7 x 6.67 x 14.85 inches (LxWxD) and weighs 21.25 pounds. 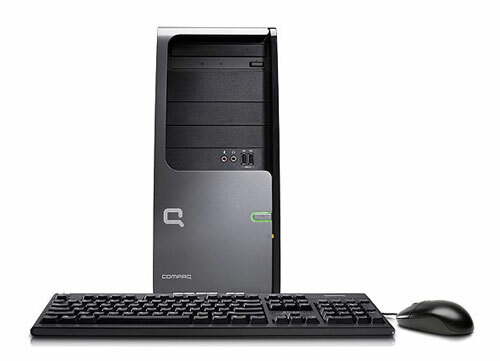 The HP Compaq Presario SR5710F desktop PC comes with a power cord, keyboard, and scroller mouse. It is backed by a one-year warranty for parts and labor from date of purchase, one-year technical phone service, and 90 days of software application support. This computer is a great value, I actually have purchased two. It has fit my needs exactly. I use them as Home Theater PC's connected to my 47" and 52" Flatscreens in different rooms of the house. But potential buyers would probably appreciate knowing certain things ahead of time, so I would like to share some of those with you. A couple things I noticed, which are not things they neglect to include on spec sheets, were no extra Serial ATA connections on the mother board, thus no extra SATA Hard Drive, or Blu-ray Burner with SATA and things of that nature. The good news is it does have two open IDE connections, which in my case worked out perfectly.. I had an old Seagate 250GB IDE, set the IDE as master on the jumper settings, connect it to the blue IDE connection on the mother board, boot the computer, enter bios, simply change the boot sequence in the BIOS because it will default to boot from the IDE Hard Drive when it is added(so if you get a OS not found message at first don't freak out). Also, (this is stated on the spec sheets) there are only 1PCIx16 and three regular PCI slots. So choose your upgrades wisely. Other than the added IDE HD, i've added the PNY - NVIDIA GeForce 9600 GT 512MB PCI Express DDR3 for Graphics, and a Swann PCI DVR 4 Camera input security card with software. I plan on using the other PCI slot for possibly a sound card, or wireless card if the PC ever gets moved away from the router. I'm not saying the computer comes up short on any of the specs, just that some of the things that they don't mention, and you find out after you purchase it. Just thought I would share what i've noticed after buying a couple of them. Sorry for the long review, but I figured the more the better in this case. I bought this for a PC Client at another retailer but I often buy from Amazon - they are great. The first one I bought would not boot, it was giving me a HAL error (Hardware Abstraction Layer) suspected a bad hard drive - could not reinstall OS from hard drive either, so back to the store it went. 2nd. computer is working great so far. You can't beat the price (I paid $299), but the reason I am writing this is because there isn't a spot designed for mounting a second hard drive, but I found a good one. Over all its decent for the price. But good luck upgrading it with another hard drive, or a decent high end video card with its weak sauce power supply. Excellent value for the money. Efficient PC with up-to-date features.. I just bought the Compaq SR5710F through another dealer, but wanted to let everyone know it really is a great product at a low price. I replaced my older Compaq model and decided not to upgrade it due to the older technology. However, I added a second hard drive using my older PATA hard drive from my previous machine as a back up. What the other guys said may be too complex in installing a second hard drive. By the way, the power supply has enough juice to power a second hard drive, but probably not additional drives beyond that. Go to HPs website and enter this model number, then select support, and look under add new hardware. Wella, it shows how to add a new or second hard drive in video format plus there is a place to actually mount it with the screw holes in the front of the chassis. You will need four screws to do this and also a PATA ribbon cable, which is still available at some retailers. The PATA ribbon cable has an extra connector for slave hard drives that needs to be used instead of the master connector. The power connector for the second hard drive is already included in the wiring harness inside this computer. Depending on whose hard drive you're using, configure the hard drive back connector program pins for slave only. Second, it's easier to reboot the computer and access the BIOS setup mode using the F10 function key, then select boot up menu and select the main hard drive to boot up as primary. If you don't as mentioned using auto mode, it goes to the slave and can't find the operating system. If this happens to you, restart the computer and go to the boot up menu. Once the BIOS boot up menu has been reconfigured, your're set to go. Hope this helps and thanks to HP on showing the hard drive installation in video format.